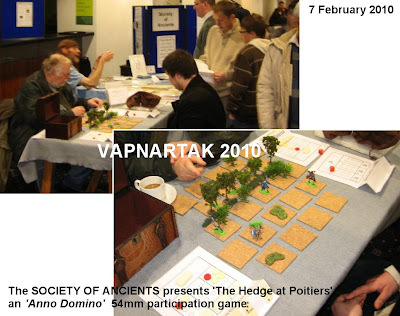 The first show of 2010 for us ... and great to be back on the road even if it is only 6 weeks or so since 2009 wrapped up at Wargamer .... 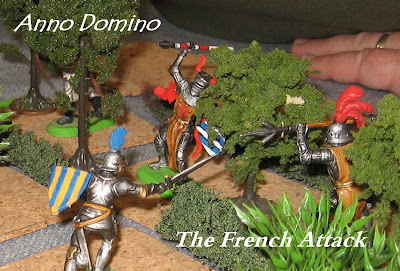 It must be the horrible 'White Christmas' winter - the wargamer's nightmare. Excellent trip up - thanks, Graham F, for driving (rare day off for Phil), plenty of traders attending (even if the Peter pig stand had been move 10 metres of so - so it took me a silly amount of time to track them down ..)..As well as the usual gear, for this show we did a trialed a multi-figure development of Graham Hockley's Anno Domino medieval combat game (as featured in the Society of Ancients booklet 'Let the Dominoes Decide' ... available from the Society website (website: games section) using 54mm individual figures. 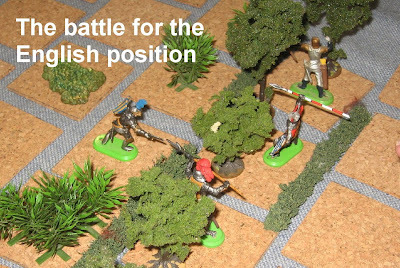 this was an attempt to try some add on rules for players to be assigned additional figures to their control - a bit like the extras in a movie (so you get to play your own character, but in the midst of a cluster of other figures which you control). We kept it pretty simple for this run of course. 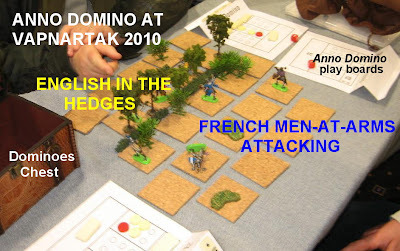 The game was 'The Hedge at Poitiers' - revisiting a theme from a recent Society of Ancients BattleDay (the Poitiers Battleday blog) ... and looking at another way to simulate the fierce man-to-man fighting Froissart describes. Ultimately, I plan a game base on the Harfleur scene in Henry V - but this was a modest attempt to test the multi figure idea. We played twenty or so games during the day - against visitors of all ages and experience level. Everyone seemed to find the game quick to pick up and exciting to play. A good introduction, I think.